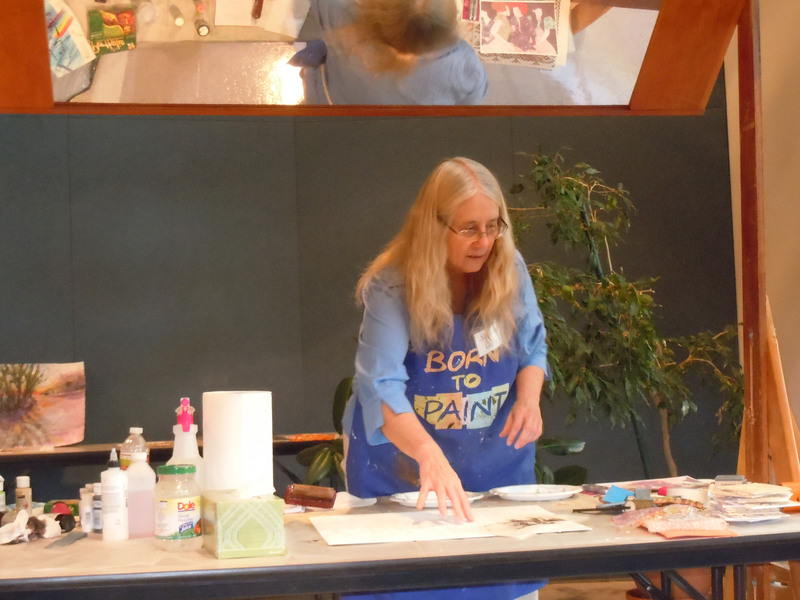 In November 2012 I did a demo using acrylic for the Texas Area Artists, an art association in Mesquite. The president is Judy Emig, an old art friend of mine. The group meets on the first Sunday afternoon of the month at 2 p.m. in the wonderful Mesquite Arts Center. The demo featured acrylic on a textured surface with stamping and stenciling for even more texture. For the grounds on illustration board, I used light modeling paste. I applied the modeling paste over a stencil with a paint scraper and pulled the stencil off, leaving a swirly pattern. I also applied the paste with the scraper to drag abstract texture over the whole piece. Other ideas for texture that I have used: gesso over cut and torn paper or over used laundry sheets. The paper can be newspaper (not acid-free), cardstock, crumpled rice paper or tissue paper — almost anything. 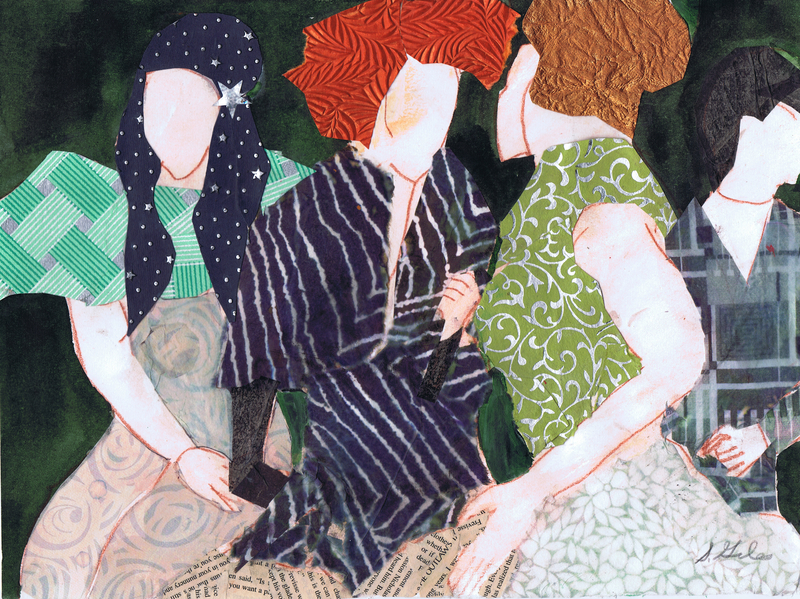 For the composition, I used one I had previously invented for the collage “Chit Chat.” It’s a primarily gestural drawing of four women. I used handmade stamps to add texture to the painting, made out of cut foam and eraser material. Also another stencil in a different pattern. Regarding color, it was done mainly in complementary red and green, with blue for a contrast color, plus neutrals black, white and grey. To make things pop, I paid attention to value contrast, and to integrate the painting, carried the colors around the composition. Other contrasts: square shapes vs. curvilinear, small vs large, warm vs. cool. I didn’t finish completely even though I paint quickly, so I finished up at my studio at home. So I made a few changes major & minor — I gave the women faces, tightened up the drawing, and moved color more around the painting. Also pushed the figure on the right more into the background. Also demo’ed my new GelliArts gel printing plate — more about that wonderful new invention soon. The painting has evolved even more. 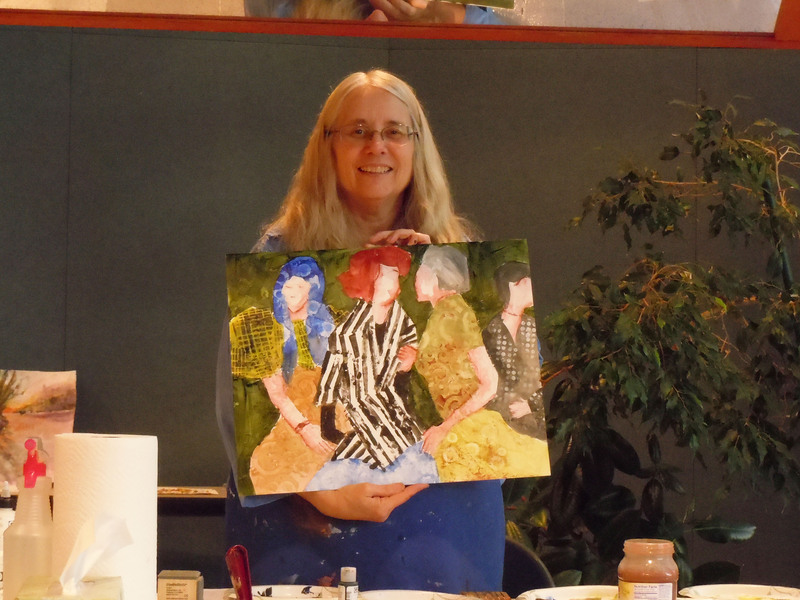 In May I took it to one of the group critique sessions run by Maureen Brouillette. She and the other artists had several suggestions. They didn’t like the green dominance, so I pushed the blue. Now the blue-orange complementary vibration is more visible instead of orange-green. Also the hand of the striped figure was awkward, so I eliminated it by putting her arm behind her. They thought the figure on the edge was distracting, so I pushed it more into the background. So which version do you like the best? I still have a preference for the collage “Chit Chat” since I’m really into pattern. 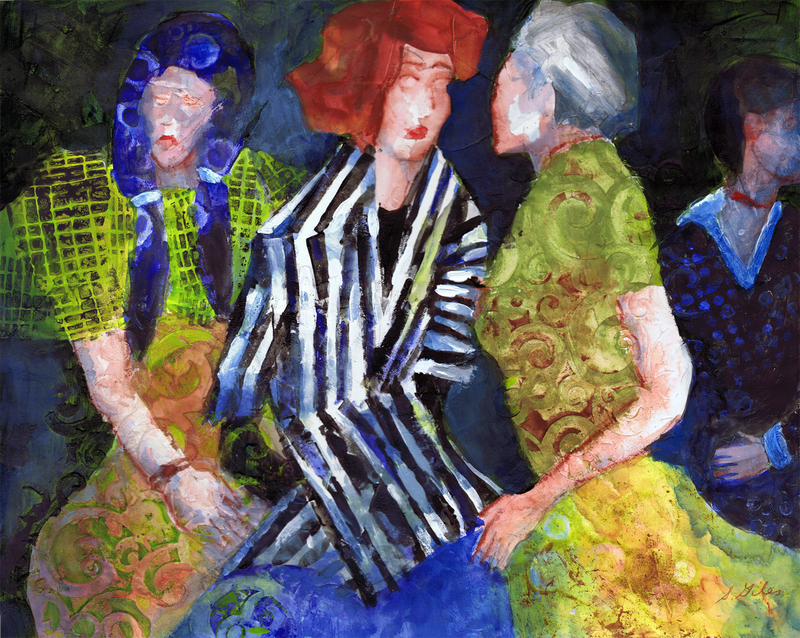 It’s close to monochromatic though, and I really love the color vibrancy of the last version of “Gossip”. But texture is probably more important on a collage than color. Should I have stopped at the first (faceless) version of “Gossip”, the second (orange-green) or is the third (orange-blue) the best? 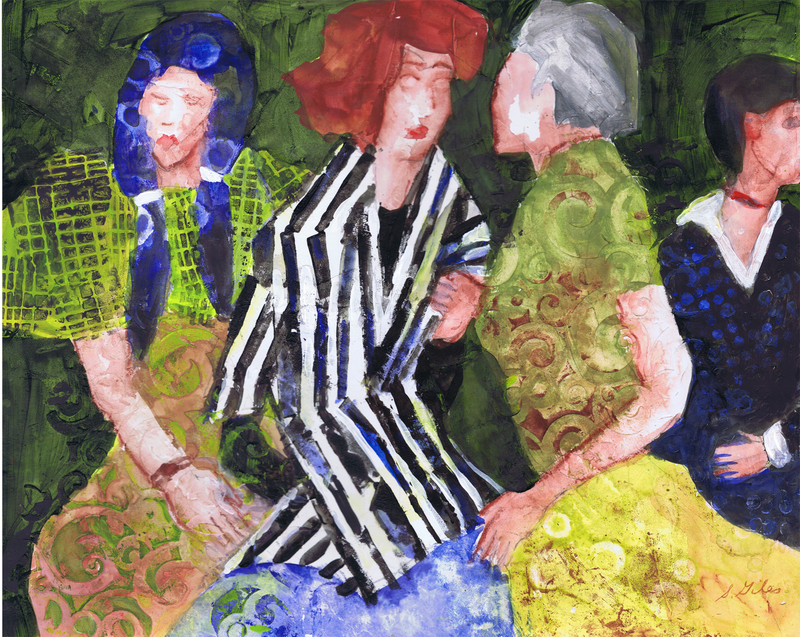 Update March 2014: “Pattern of Gossip” has been accepted into the 2014 Society of Watercolor Artists International Exhibition. The orange-blue final version is vindicated! I love “Gossip” in multi- media! Let me know when is your next workshop..